I arrived in Priory Park — a very short jog from home — as the traditional aerobics warmup was beginning. I didn’t join in, but wandered around finding fellow Heathsiders to chat with, while swinging my arms and shaking my legs out to loosen things up. This year was warmer than last year but not as hot as 2014. The weather was partly sunny — I’m glad I wore my sunglasses, as the sun got strong on the second lap — and about 59F/15C with a light breeze. Not quite perfect running conditions, but not too bad considering what it could have been like. Traditional photo of the aerobics warmup. Pretty sure I got almost the exact same shot last year. I have finally started to feel properly fit again after my longish layoff over the Christmas holidays: I’ve done a number of “long” (it’s all relative) 11-12km runs in the past month or two, though speedwork has been lacking. I did return to the track the other week for the first time in a while and hope to make it a more regular occurrence throughout the rest of the spring and summer. All of that is a long-winded way of saying I’m in pretty-good-but-not-PB-shape. My goal for this year’s Crouch End 10k was to run under 50 minutes, with an ideal time of around 48 minutes. My rough plan for the race was to run the first 5km steady, between 24 and 25 minutes, then negative split (run a faster second half) with whatever I had left. I knew the first kilometer might be quick with the excitement of the start and getting swept along in the flow of runners, so I allowed for that and decided to settle into a steadier pace once the pack thinned out. I’ve been throwing kilometer surges into my longer runs, so I also knew that I could finish strong with a fast final kilometer. The race went more or less to plan. I ran alongside a fellow Heathsider for part of the first kilometer, and was pleased to go through 1km in 4:42. I was surprised that my second kilometer was even quicker, at 4:36, although looking at the elevation profile it was slightly net downhill. Alun caught me up around then; we had a brief chat about goal times and then he sped ahead. Photo credit: Maz St H.
After the slog uphill, we descended into Ally Pally park and along the newly paved section that was lined with cheering families. This bit is sneakily uphill — I’m glad I re-read my previous race recaps before running this year, as they reminded me of that fact. We wheeled down and around onto Priory Road, where I gave a wave to Chris, a fellow CEFC singer who was spectating (there were a few other singers running — or is it “running singers”?). Photo credit: Marc Gardner Photography. Passing my favorite part of the course — the group blasting “YMCA” — around halfway gave me a boost: I went through 5km in 24:15, right around my target. My 6th kilometer was also quick (4:40), which allowed me to ease off a bit going up the big hill for the second time. 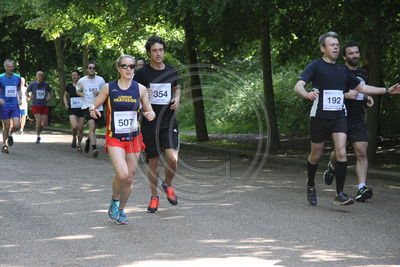 When I entered Ally Pally park again with 2km to go, I spotted Caroline up ahead and made it my goal to catch her (sorry, Caroline, I can’t help it!). I was definitely struggling by this point but dug in and repeated my mantra: I’m strong, I’m healthy, and I’m fit. If I could get to 9km, I could pick it up for one more kilometer. Believe it or not, I am actually running in this photo! Photo credit: Marc Gardner Photography. So that’s what I did. As soon as I got onto Priory Road for the final straight before curving back into the park, I lifted my knees, pumped my arms, and turned it up a notch. Perhaps it was a bit early, but I stayed strong and even had a bit left for a brief kick to the finish, pipping a couple of guys right before the line. I finished in a gun time of 48:08 and chip time of 48:02 (I’m going with the chip time — that’s 4:49/km or 7:45/mile pace). I was the 32nd woman out of 472 and finished 243rd out of 1,100 runners. I’m really pleased with my time — it’s just about what I expected I could do based on my current fitness levels, and it’s my quickest time on this course. Can’t complain about that! For you stat nerds out there interested in my splits. It’s not the best course for even pacing. Click to enlarge. The 3rd and 7th kilometers (6.5-7.5km, to be exact) are the hardest in this race, heading uphill parallel to the train tracks and past Alexandra Palace Station. Those were my slowest splits of the race — hard on the second lap, when my energy levels naturally dip around 7km. 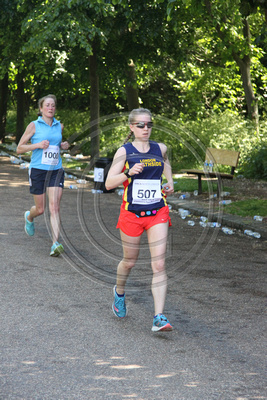 It helped to have a woman in a Trent Park vest in my sights for a large part of the race, and we flip flopped a couple of times. It’s always nice to have another runner to keep an eye on, and there were plenty of other Heathsiders around to encourage as they passed me or as I passed them. The Crouch End 10k course is notorious for its difficulty. I don’t think I’ve ever heard a single runner say they actually enjoy the twists, turns, and hills. At least it gives us something to bond over! And the odd bollard, sharp turn, and cutting on and off the pavement certainly keep you on your toes. The support around the course can’t be beat, and it’s always great to have loads of Heathsiders marshaling, too, for that extra special personalized support of “Come on, Heathside” and “Go, Tammela”! This entry was posted in community, exercise, health, pictures, running and tagged 10k, 10k race, 10km, 10km race, CEFC, Crouch End, Crouch End 10k, Crouch End Festival Chorus, London Heathside, road race, road racing, running, YMCA North London on 21.05.2017 by taplatt.